Heart is a vital organ in our body. There are many natural ways to keep our heart healthy and strong. The herbs play an important role to give strength to heart muscle. There are many herbal remedies explained in Ayurveda for heart problems. I regularly come across many heart patients at my clinic. The people are suffering from heart problems as they do not ever try to think about alternative remedies for heart problems. There are many natural ways to keep our blood pressure and cholesterol under control rather than chemical based synthetic drugs. There are herbs like Arjuna, Hawthorn, Grape Seed, Pomegranate Seed and many other herbs which give strength to heart and help in cleansing of the arteries. The blockage in the coronary artery can be cleared with the help of such natural remedies and products. I am a firm believer of Ayurveda and natural remedies. In my clinical practice, I regularly come across many heart patients, who are suffering because they never tried herbal remedies for heart problems and neither have they had an open or favorable attitude towards natural remedies. Although I can legally practice modern medicine, but still I prefer natural products over chemically made synthetic drugs. Healthy Heart Support : 2 capsules twice daily after meals with plain water. Arjun Tea: 1 -2 cups twice daily boiled with milk and water. Arjuna is a huge tree and the bark of this tree has been found to be very useful in many cardiac ailments like Congestive heart failure, Angina, Myocardial infarction, high cholesterol, blood pressure, blocked coronary arteries. Total heart support contains extract of the bark of the Arjun tree. Other herbal extract in Total heart capsules are Ashwagandha (Indian Ginseng) to calm down the nerves and strengthen them by providing nutrition to them. Total Heart Support is a vegetarian capsule based formulation. I prefer Vegitarian caps products over the hard gelatin products, since they are purely natural. Total heart support or Arjuna capsules are best heart care remedies without any side effects. Arjun tea is another product containing Arjuna bark powder. People can use it as a regular tea, any number of time. It is delicious in taste and I use it personally everyday, even if I am quiet healthy. This is for not only for prevention of blockage in the coronary arteries but also for removal of high cholesterol from blood, control of blood pressure. I have seen miracles happening with this tea alone. I have so many worldwide patients because of this tea only. Can be used with Heart Support Capsules. This is the best herbal heart care remedy. For people suffering from corornary artery blockages, high cholesterol, blood pressure, I would recommend all these 3 products, which are amazing. They not only cure the problem but also give strength to the body in general. This product has its roots in Ayurveda-ancient herbal healthcare system of India. According to Ayurveda the balance of 3 energies- Vata, Pitta and Kapha (Kinetic, Thermal and Potential energy) in the body is a disease free state whereas their imbalance causes diseases. The herbs in this product act synergistically to control "Vata" and "Pitta". According to Ayurveda "Vata" and "Pitta" are considered responsible for blood pressure, stress, anxiety and heart problems. Herbs in Total Heart Support: Total Heart Support is purely a herbal formulation without any chemicals added into it. The ingredients are frequently used in Ayurvedic system of medicine since 5,000 B.C. without any side effects. Dosage - 1-2 Capsules twice daily, with plain water, after meals. Indications - Heart Support capsules are an effective natural treatment for High Cholesterol, Blocked Coronary arteries, Congestive Heart Failure. They give strength to failing heart muscle. Heart Support capsules are 100 % vegitarian, purely natural, without any side effects and without any chemicals. Heart Support capsules help in cleansing of the blocked arteries. They are useful in post heart attack period or post myocardial infarction support. They are a natural treatment for High Cholesterol, especially high triglycerides and many other heart problems. They make an excellent natural remedy for CHF or Congestive heart failure and breathlessness due to weakness of heart muscle. Side Effects - No Side effects, Can be used with other herbal Supplements, Vitamins or other herbal remedies or natural products. The bark of this tree is used in Ayurveda for prevention and treatment of many heart problems like angina, coronary artery disease, congestive heart failure, high cholesterol and blood pressure. Extensive research has lead to discovery of cardiac glycosides in the bark and naturally occurring Co-Enzyme Q 10, which is really important nutraceutical for proper functioning of heart muscle. It gives strength to ailing heart and controls the cholesterol levels. Ashwagandha is also commonly known as 'Indian ginseng'. It is a unique herb with multiple functions. It contains active components like 'Withanolides' and 'Withaferin' which are very beneficial for nervous system. The herb also possesses anti-inflammatory, antitumor, antistress, antioxidant, immunomodulatory, hemopoietic, and rejuvenating properties. It is especially useful in diabetics and blood pressure people as it also controls diabetes and blood pressure. It relieves stress, anxiety and enhances physical and mental performance naturally. This herb is useful in many illnesses like blood pressure and hysteria. It controls epilepsy, mental disorders. It relieves stress and anxiety. The herb 'Brahmi' is used in Ayurveda since ages for loss in memory, lack of concentration, forgetfulness. It increases the retention power as well as recollection. It is very useful in many mental illnesses also. Regular use also helps in stress, anxiety, blood pressure, hallucinations and epilepsy. Regular use of this herb improves mental ability and cognition. This beautiful white flowered plant really enhances the mind ability to recollect and remember the things in a very effective manner. It relieves mental stress, controls blood pressure and also improves mind's ability. People in India are using this herb for centuries for their children to improve their memory especially during exams. 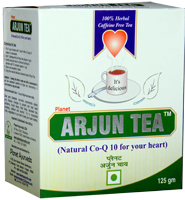 Arjun tea is a unique herbal product among the best of all Herbal Remedies for Heart problems, Coronary Artery Disease Herbal Treatment for Heart problems and many other Herbs for Blood Pressure . Arjun Tea is the combination of purely herbal ingredients described in ancient Ayurvedic texts as the most effective treatment for blood pressure and heart problems. It is the safest choice to the problems like hypertension, high cholesterol, fatigue, blocked coronary arteries.Arjun Tea is made keeping in mind pure Ayurvedic ways of healing. The product comprises of safe herbs that are used in Ayurveda since times immemorial. Ayurveda-The ancient Indian healing system has been into practice in India for more than 5000 years. Utilizing herbs, minerals, proper nutrition, purification and above all, affirmative ways of living. The concept of Arjun Tea is based on preparation described in Ayurvedic texts as "Ksheer Pak" i.e. boiling the herbs in milk and water to get both water soluble and fat soluble liquid extracts from the herbs to get maximum benefits.